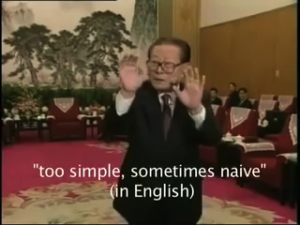 A cultural phenomenon called ‘mo ha’ (toad worship) has been increasingly popular on the Chinese Internet since 2014, with ‘the toad’ referring to former Party and country leader Jiang Zemin. His memes have gone viral. To examine the toad worship fever, I propose a two-dimensional framework: on the one hand, it differentiates the political and apolitical aspects of the content, and on the other hand, it draws from James Carey’s two views of communication to examine the functions. I collected and analyzed more than 100 toad worship memes, interviewed 24 creators and sharers of the memes, and conducted participant observation in two toad worship online communities. The framework yields four aspects of the phenomenon: implicit criticism toward the current leadership and the regime, ritual satire among groups of dissidents, playfulness, and a shared community with cultural capital and rituals. The motivations of participants are not only multi-faceted, but also fluid. This study contributes to the study of Internet memes and online expression in authoritarian regimes. Top Paper Award, The Association for Chinese Communication Studies, NCA 2016 Annual Conference.